What if students took on more of the “teacher workload” and in the process became more engaged and invested in school? Instead of running around crazily as stressed-out adults, why not invite students to be a part of the essential work that happens at schools, such as having a say in how schools spend money, plan events, and communicate with parents? We have been thinking about this a lot this year, especially in the midst of new demands placed on educators. At Sandburg Elementary our principal has branded 2014-15 the “Year of the Student.” This is all about teachers working together to create opportunities for student leadership and ownership of learning. Instead of rushing to school early to write a morning message, pass the markers to the students. Instead of hurrying to finish a newsletter on a Friday, have students do it by writing about what they learned that week. Instead of stressing about planning school assemblies, let students take charge. For instance, Sandburg’s fifth grade students lead whole school assemblies where teachers are in the audience and students are front and center. Instead of coordinating field trips, empower student leaders to plan outings by contacting organizations, writing permission slips, and setting up transportation. 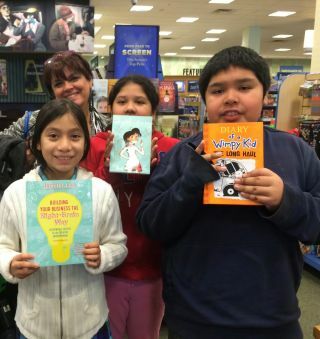 One of our students’ favorite experiences this year has been spending thousands of dollars on books for their classroom and school libraries. Due to high poverty, our school is eligible for Title I funding. Historically adults have been in charge of figuring out how this money is spent, but this year each child in our school was in charge of spending fifty dollars at Barnes and Noble to shop for books to fill their classroom libraries. Additionally, students created surveys to determine how the school library budget would be spent. Before the trip students surveyed their current classroom libraries; created online wish lists within their budgets; and graphed the genres of books selected to decide if their choices supported a balanced classroom library. This culminated in a joy filled day they will always remember and left them with a personal investment in how they care for and engage with their refreshed libraries. Turning over the book selection to students connects to reading research around student choice improving academic outcomes and saved teachers hours of time that would have been spent paging through catalogs and placing orders. And after all, the best experts on what kids like to read are kids themselves. Inviting students to participate in these practical, fun tasks incorporates standards into authentic learning experiences, allowing students to understand how school applies to everyday life, while helping teachers save time. What could you subtract from your to do list, that your students could take on?